My kids love the smell of sunscreen. The moment they smell it, they can’t stop talking about going to our local pool, to the beach or to the park for summer picnics and bike rides. So, I thought it would be fun this summer to find a way to put the scent of summer throughout the house by using their favorite sunscreen as an air freshener! Put about a 1/2 cup of baking soda on a paper plate. Spray sunscreen directly on the baking soda and then stir it with a spoon. Fold the plate in half so that it forms a funnel for pouring the powder into the jars. Repeat for each jar. Then cover each jar with the lids that have holes. Save the lid covers that came with the jars and put them in a safe place for using another time. 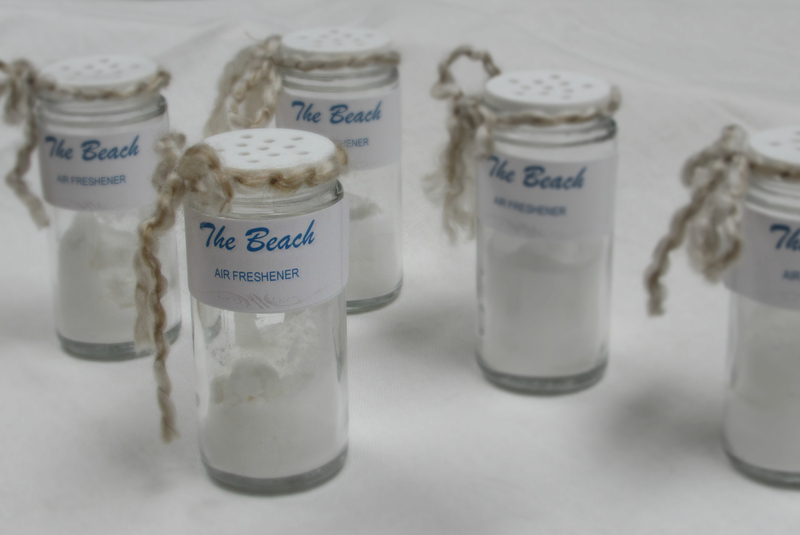 Add labels to each jar so family and guests know what is in them! Then decorate each jar with yarn, ribbon, or string. 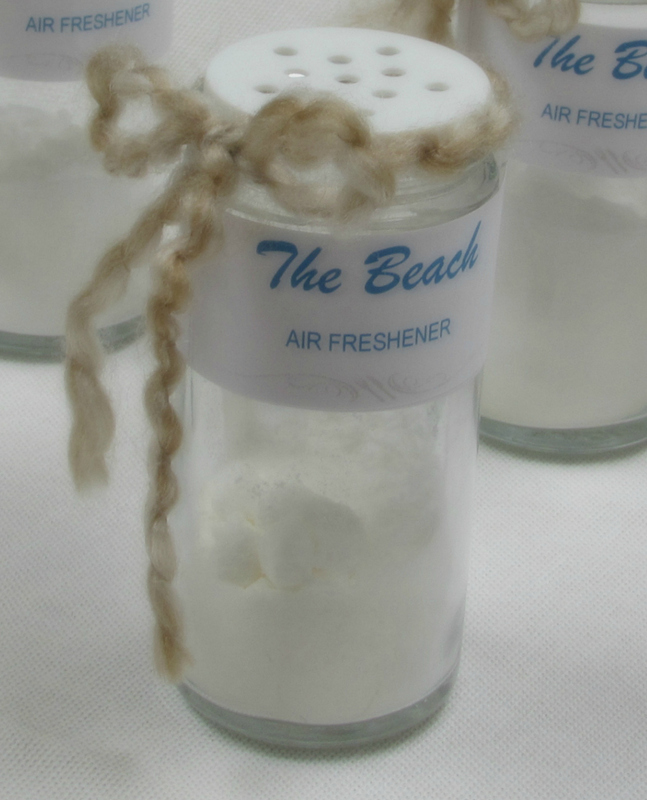 Place your new “beach” scented air fresheners on shelves and tables throughout your house! Those are so cute, and sounds like they smell great! 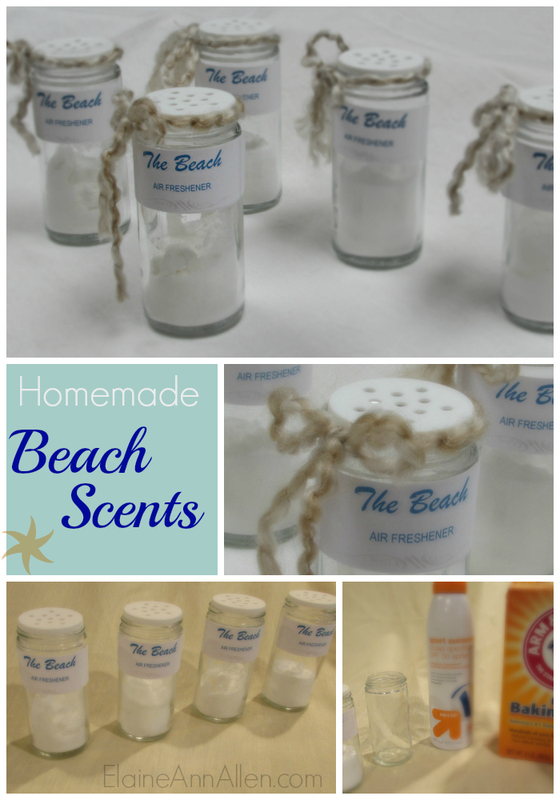 I never knew you could make homemade air fresheners with just baking soda and some oils, or in this case, sunscreen! I’ll have to give this a try, thanks! I saw this yesterday and fell in love with them. I’ve pinned them so I can create them later. I LOVE the beach and beach smells. Thanks for pinning and for stopping by!!! This is such a great idea! I am definitely interested in making this for my house. These will make the cutest gifts for friends too. Thanks for sharing! Those are absolutely adorable! I love how cute they look and how they make the house smell nice too, what a fantastic idea! Hannah Louisa Nicklin recently posted…Sisterhood of the World Bloggers Award! Thanks so much Hannah. So nice of you to nominate me!!! Thanks Hannah! And thanks for the use of the graphic, I love the way it looks. Love the air fresheners diy, I’m going to have to do this. My kids also love the smell of summer, and I imagine this would be a great smell to add to the bathrooms. I use them in all of my bathrooms. Works great. Thanks Randi!!! this is such a cute and fun idea! I love it! Love the shaker tops! Thanks for sharing. Such a cute idea! I would have never thought to do something like this. Such a great idea!! I’ll have to try this, getting tired of my glade plugin’s. I never knew you can make air fresheners for baking soda! I have to try these, I even have some of the items already. Imma have to try this before I go to the beach! That is such a neat idea! Do they give off a strong noticeable scent? And where do you typically sprinkle them? Awesome idea! This is my first time seeing this type of diy air freshener. I need to try this one day. Love this! They looks so adorable! This is a great idea! I know I threw out a little spice jar earlier today so I think I’ll have to go and rescue it now! annabelt recently posted…A War of the Worlds Diet: Probiotics of Course! Wow I learn something new everyday! I didn’t know that baking soda could be used to make air freshener. Great idea!